“Stationary” is when your business stands still. Stationery with an “e” is the sharp corporate identity that your business presents on it’s letterheads, compliment slips, notepads, envelopes and other pieces of printed communication. 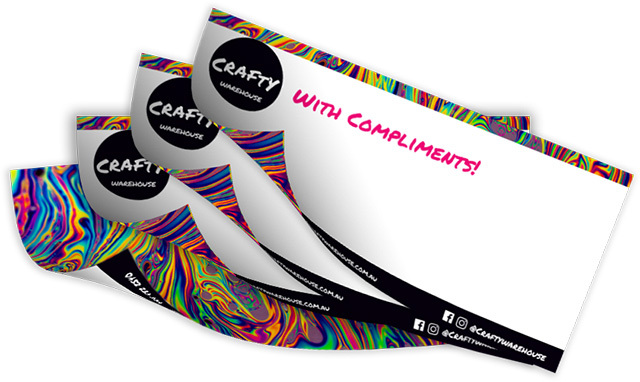 Print your stationery is glorious full colour for that extra professional look and feel! Not sure where to start with your letterheads? All good! Read below for all the basics you need to know about sizes and stocks. Get an instant price on printing your very own stationery to get started. 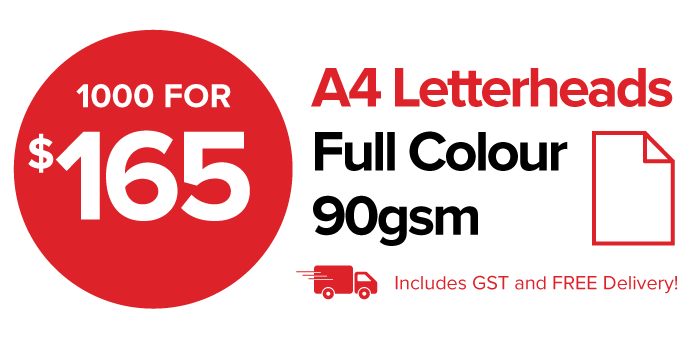 Perfect for printing letters, invoices, statements and proposals. Fold a letterhead twice to fit into a DL envelope. Loose sheets or “padded” as a notepad to peel of sheets. Use notepads in your office, or gift them as branded stationery to your clients. Hand-writing on your “with compliments” slips are a nice personal touch. The standard stationery stock is 90gsm, a bit heavier than 80gsm copy paper. A little heavier than standard 90gsm bond stock. This bright white stationery stock has seen it all before! 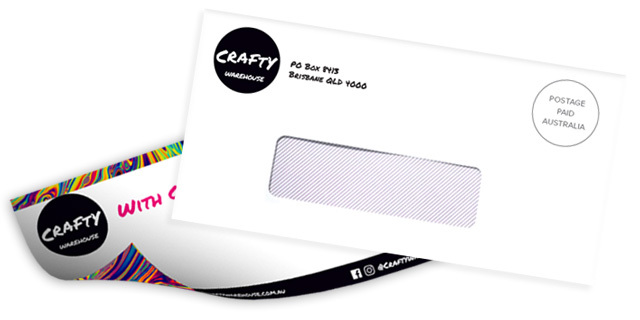 Print your own envelopes for a full branded package! Envelopes come with or without a window in the front side to display your customer’s address on the document inside the envelope. We print pre-assembled envelopes, which means printing can not extend to the very edge of the envelope. Consider printing your envelopes with a company logo, and return address on the front side. Printing on the back side is very limited with the peel & seal flaps. The cheapest way to print envelopes is with a single spot colour – black / greyscale being the cheapest. We can also print in full colour CMYK. Fits a DL Compliment Clip, or folded A4 Letterhead. Larger than a DL Envelope, which may attract higher postage rates. Fit an entire A4 Letterhead in without folding. Perfect for brochures and reports. C5 Envelopes fit an A5 sheet inside. The opening flap is on the short edge at the back side.